Hey Friends, today I wanted to share with you a quick & easy breakfast I’ve been loving! Greek Yogurt with Blueberries & Granola. Sometimes I will have this as my lunch if I’ve eaten something different for breakfast. This is so easy, delicious and perfect for weekday mornings. When school is back in session I am usually running around in the morning making sure everyone is dressed, hair combed, breakfast, teeth brushed, deodorant on, backpacks, lunches…it’s a lot! But to make sure I have eaten a good breakfast is another story, that’s why I love this breakfast, I can throw it together in no time! You can use whatever brands you like but, I really like Chobani for Greek yogurt and Nature Valley for granola. Get your bowl of choice and add 1 cup Greek yogurt. Now do a criss-cross design with your honey. Plain Greek yogurt isn’t sweetened at all, so don’t think you are putting too much! 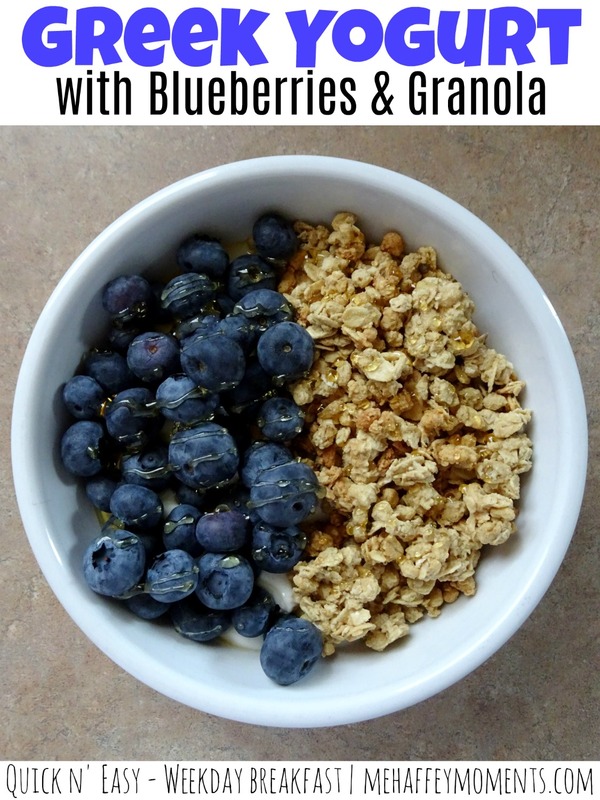 Now add a good handful of blueberries and a good handful of granola. This is completely optional but, I like adding a little drizzle of honey on top. After this, I usually stir it all up and enjoy! This is the perfect easy breakfast idea and would be perfect for college students too because it doesn’t involve any cooking. Let me know if you try my version of Greek Yogurt with Blueberries & Granola!